BBC Two - Trust Me, I'm a Doctor, Series 4, Episode 4 - Can my scales ever be wrong? Keeping track of our weight is a tricky business and one not helped by the fact that our scales often seem to give us varied and contradictory results. So are they at fault, or are we? Stepping onto the scales can be a demoralising experience. Why is it that after weeks of dedicated dieting your weight seems to go up as often as it goes down? Well, while there are probably plenty of dodgy scales out there spewing out bogus figures, for the most part it’s how we use them that’s the problem. Many of us weigh ourselves infrequently and irregularly and this is our first mistake - single measurements of weight are highly unreliable and comparing one with another is close to pointless. This is because our mass changes constantly throughout each day due to things like eating, drinking, water retention, going to the toilet, sweating and, somewhat surprisingly, breathing, when we lose mass in the form of water vapour and carbon dioxide. These natural variations can cause our weight to fluctuate by as much as 1-2kg per day, making it very difficult for us to tell how much of the variation we see is actually due to the gain, or loss, of body fat. Fortunately, if you want to track you weight accurately there is a way to cut through this natural variation. 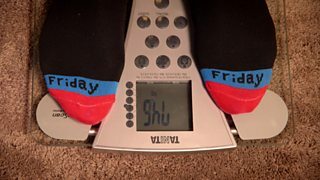 You should aim to weigh yourself naked (or always in similar clothes) and you should always use the same set of scales on the same hard surface. If you put the scales on carpet you could find yourself weighing a lot less or a lot more depending on the scales and carpet in question. When we tested this on Trust Me, I’m A Doctor, our volunteers appeared up to 10kg lighter when they placed the scales on carpet. This was because the pressure sensors on our scales were sinking so far into the carpet that the carpet fibres came into contact with base of the scales and absorbed some of the weight. With different scales and carpets the effects can vary – sometimes people seem heavier – but one thing we can be sure of is that none of these readings will be accurate. The other thing you should do to track your weight accurately is compare averages rather than individual figures. Ideally you should weigh yourself every day at the same time of day. Then at the end of each week calculate the average. After a few weeks you’ll be able to see if there are any upward or downward trends. Another option is to weigh yourself once a week, on the same day each week, and calculate the average every month. This will still help you to pick out trends, but it will take a lot longer. What’s more a study in the US found that people who weigh themselves daily are more likely to stick to their goals and keep weight off.